More impressive still is that because LEVAN uses text and image references to teach itself concepts, it’s also able to learn when words or phrases mean the same thing. So while it might learn, for example, that “Mohandas Gandhi” and “Mahatma Gandhi” are both sub-concepts of “Gandhi,” it will also learn after analyzing enough images that they’re the same person. So far, LEVAN has modeled 150 different concepts and more than 50,000 sub-concepts, and has annotated more than 10 million images with information about what’s in them and what’s happening in them. The project website lets you examine its findings for each concept and download the models. According to a recent presentation by one of its creators, LEVAN was designed to run nicely on the Amazon(s AMZN) Web Services cloud — yet another sign of how fast the AI space is moving. Computer science skills and math knowledge are one impediment to broadly accessible AI, but those can be addressed by SDKs, APIs, and other methods of abstracting complexity. However, training AI models can require a lot of computing power, something that is easily available to the likes of Facebook(s fb) and Google(s goog) but that for everyday users might need to be offloaded to the cloud. Big deal. ProBase out of Microsoft Reseach did this almost three years ago and they have a concept gallery in the millions. Cloud is terror. Iot is terror. AI is terror. Neither creed nor code is answering risk. And there are limits to what can be solved algorithmically. Read Roger Penrose’ “The Emperor’s New Mind”, especially the chapter on Kurt GÃ¶del who proved mathematically that no more than 50% of proofs can be solved algorithmically. For others reading this, I’m almost certain that Goedel’s Theorem does not talk about any percentage, i.e. “no more than 50%” is false. I don’t see a great benefit for everyday users of PCs at a normal level. Artificial Intelligence is exactly that “Artificial”. A computer can never reach the level of analysis, understanding, comprehension and creation of a human mind. If a power failure stops a computer functioning it will always need the human hand to restart it or restore power! Yes, there had been enormous advances in AI but the human brain as you already know is only using a 5 to 10% of its mental power. Can you imagine what it would be like if we discover a way to increase that level to higher percentages? Is there a license (hopefully creative-commons share alike) for this blog posting so that i can repost in other media ? 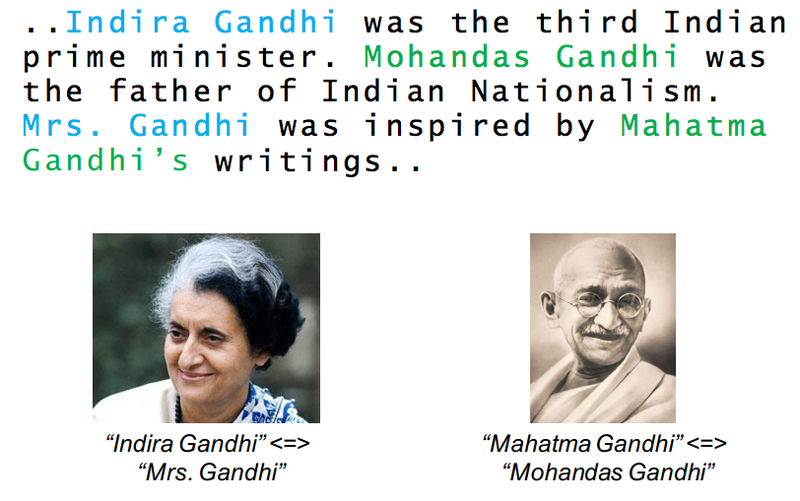 Indira Gandi is not a wife of Mahatma Gandhi. LOL. Depends upon how it is programmed. When a human has every bit of information needed to make a sane and rationale decision, including a matrix of results for each possible decision, wrong decisions continue to be made. One must also consider that not all bad decisions are wrong, nor that all wrong decisions are bad. All it takes is one stray gamma ray or one heart string pluked to make a decision that is not the optimal choice. My main question is how do you teach it what is canon? There is so much non-authoritative data out there that humans can’t tell what’s true anymore. Still for basic hierarchical organizing of subjects/objects it’s an innovative start. Pretty soon, the machine will say: “what’s that idiot who wants to borrow my circuits? Go upload yourself to a light switch pinhead! Isn’t this just like whatson? It is impressive to know that computers are now made to learn by itself. But do those people ever think what is the fine-line extent of such project. Mrs. Gandhi was never impressed with anyones writings — being illiterate despite her fathers best effort to send her to good schools. And she was kind of related to the other Gandhi — he adopted her as her father refused to walk down the plank with her to marry her off — and the old man had penchant of hanging around with your girls — a computer will never know all this .. would it ? oh well not for another 100 years ..
Well I am not impressed with the Gandhi example. Indira Gandhi wasn’t inspired by anything in her life — particularly anything written because she was fairly illiterate despite her fathers best efforts to send her to the best schools. And of course she WAS related to the other Gandhi .. having been quasi adopted by him — her father refused to walk her down the marriage plank — and the older man who had a penchant for young girls did .. well a computer will never know all this nuanced stuff for at least another 100 years .. so I am not impressed! (See the results in section 5.) Looks like the kind of result that will have loads of amazing applications (improving things across the board) — only time will tell. Interesting paper indeed! But there was a very good reason as to why Martens came up with Hessian-Free… Scaling down MNIST??? Well, interesting nevertheless, and it might be possible to apply ideas to methods that use approximation of Hessian. Hopefuly. Is this intelligence or just plain smart? It’s intelligence using only one facet of our human abilities – to recognise patterns. We still do it much better than LEVAN or any other AI ever will. That would be my bet. True in many respects, but speed and scale are what make AI so compelling for certain things, especially classification. People can only remember so many names, faces, facts, etc. NELL is supported by the DARPA, Google, Yahoo.